SPL: A pie for a new era? Is the homogenisation of the football experience set to take another giant leap forward? 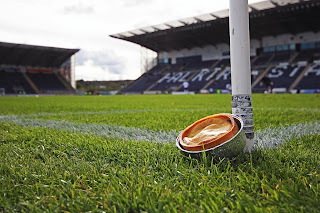 Reports this week suggest that Greggs, highly visible high street purveyors of steak bakes, are in talks to take over the catering franchises at every SPL club. The Greggs phenomenon has pretty much passed me by. I've tried them, of course, but I've never found anything particularly worthy of queuing up for at lunchtime. Plenty obviously disagree. And if you're happy to queue up in the rain on your own time, you'd probably be happy to queue up at half time. It would deliver the SPL a high profile commercial partner - could we have the Greggs Sausage and Bean Melt SPFL SPL in a couple of seasons - and deliver Greggs a captive market. I don't know exact figures for these things but current catering franchise tactics at football grounds seem to be based on selling the lowest standard of food for highest possible price while, I'll uncharitably suggest, not paying top dollar to attract top quality staff. It's idle speculation to say how much Greggs would recognise in that particular model. I'm the sort who wallows in nostalgia, who harks back to the days when the local High Street didn't have the uniform sequence of bookie, Greggs, charity shop, bookie, Cash Converter, pound shop, pawn shop, charity shop. I'm not like the SPL, an organisation defined by its desire to explore new worlds. That their explorations in football have been a failure does not mean they shouldn't be encouraged to find a new frontier in meat filled pastry products. One day a contented Neil Doncaster will be able to sit back and say that, when Hearts were in administration and Kilmarnock in uproar, he "had a very productive chat about pies." "Currently we have no plans to supply the Scottish Premier League but are always open to new business opportunities." Which might mean this is all bunkum. Because it's been a long time since anyone saw the Scottish Premier League as a business opportunity.